Sokei-an Says: The Silence of Surabha -- The Buddha's confrontation with Surabha near Vulture Peak. Buddha Nature -- Buddha living in the western sky. Isshu Miura Roshi Teisho, with references to Kikan 'Admonitions', Mumonkan 'Gateless Barrier', and the story of Jimyo from Zenkan Sakushin 'A Zen Whip'. 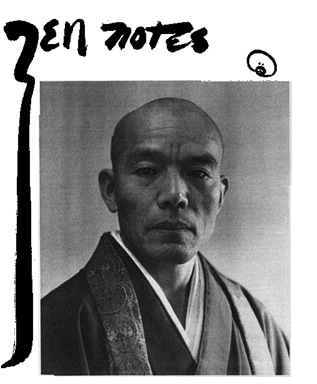 Cover: Photo of Isshu Miura Roshi on the occasion of his birthday, April 10, 1956. The Practice of Chihkuan: Chihkuan (or Shikan or Shikantaza) meditation -- a form of tranquil meditation, on the Alaya Vijana consciousness different from Rinzai Zen. 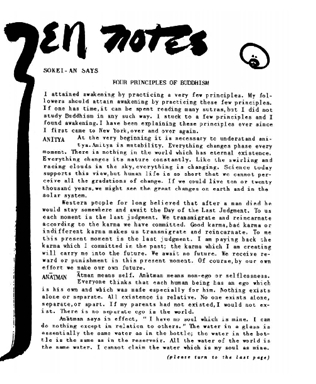 Zen - A Method of Religious Awakening: From a talk given by Ruth F. Sasaki at the Massachusetts Institute of Technology Nov. 25, 1958. 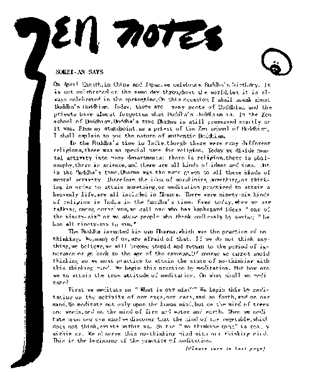 Letter from Kyoto, regarding 1893 conference of the religions of the world, Shaku Syoen, D.T. Suzuki, Dr. Paul Carus, Nyogen Senzaki, Shaku Sokatsu, Nanshinken Roshi, Goto Zuigan Roshi, Asahina Roshi and Isshu Miura Roshi, by Ruth F. Sasaki. California Style -- A death at a Japanese No Dance event with Paul Reps and Nyogen Senzaki, by Mo-Rin. 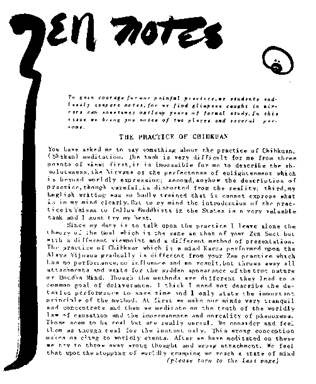 Soothill's Dictionary definition of Chihkuan, a form of T'ien-T'ai meditation. 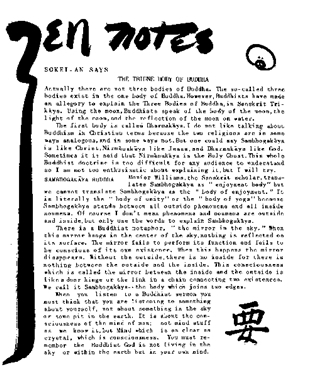 Sokei-an Says: April Eighth, Buddha's Birthday -- a brief teisho. A Cause For Celebration: Isshu Miura Roshi's arrival in New York, his interactions with the immigration service, supervision of the preparation of the zendo and public meeting room, and birthday celebration on April 10. Sokei-an Says: Perfume -- You can feel the tranquility of a person who practices samadhi. The Three Worlds, Part I: Kamadhatu - realm of desire, Rupadhatu - realm of form and Arupadhatu - formless realm. 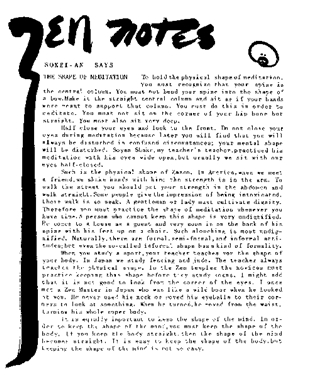 References to Udraka Ramaputra and the "Sound of one Hand"
We Get Letters -- letters from around the globe to the editor of Zen Notes. Correction: D.T. 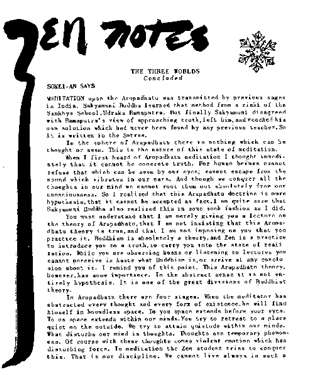 Suzuki was not translator for Soyen Shaku at the World's Parliament of Religions in 1893. 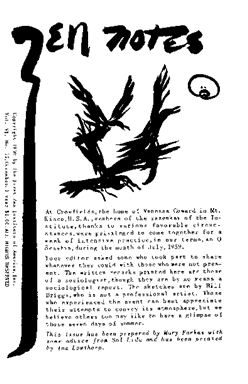 Cover: Poem by Toba Shu, with translation and calligraphy by Ruth F. Sasaki. The Three Worlds Concluded: Sokei-an Says: Meditation -- references to the Samkhya school of meditation, Alara Kalama and Udraka Ramaputra, four stages of Arupadhatu meditation, Rogue River Valley in Oregon, the Deer Garden, King Bimbasara and Mahaprajapati. Chuho Koroku poem: "In my heart I hang the old mirror....", with Chinese calligraphy. Letter From Kyoto -- subscription details, $1 per year. Letter from Kyoto -- Ruth F. Sasaki's return to Kyoto in 1959. Includes references to Ryosen-an, Mount Hiei, Goto Roshi, Daitoku-ji, Hoshun-in, Daito Kokushi and Daio Kokushi. When I Was Very Young: Five Desires: to eat, to procreate, to become wealthy, to become famous, to sleep. Sokei-an Says: The Blindness of Anuruddha: Anuruddha, the Buddha's Cousin makes a vow never to close his eyes and soon goes blind. 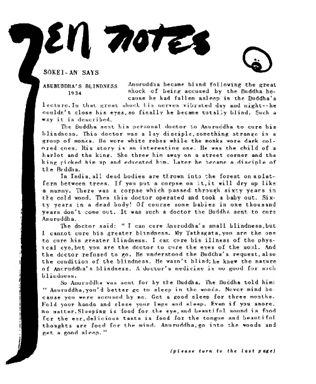 Anuruddha loses his physical eyes but discovers his spiritual eye. Have Zabuton Will Travel - Cartoon by William Briggs. Existing Translations in English of Zen Works in Chinese and Japanese, by Ruth F. Sasaki. Includes Shinjinmei "On Believing in Mind" by Seng-tsan (Sosan) third Patriarch of Zen in China, Shodoka "Song of Enlightenment" by Yoka Daishi, Rokuso Daishi Hoho Dankyo "Sixth Patriarch's Sutra" (From Tun-huang), translated by various translators. Letter From Kyoto: A discussion of translations of Zen texts into English, French and German. Sokei-an Says: Anuruddha's Blindness -- Anuruddha is counseled by the Buddha to go and sleep the deep woods. Anuruddha gains spriitual insight. No Purpose, 1938. "In these lectures of mine, I am selling my nothingness; it is the greatest thing that can be bought, spaceless and timeless." Sokei-an Says: Four Principles of Buddhism: Anitya -- impermanence, Anatman -- selflessness, Nirodha -- nothingness and Akasa -- endless space. Zen and the Religious Feeling, by Sokei-an Sasaki: Shinto God, personal gods, God-Like-Zen. Letter from Kyoto: References to Gary Snyder's return to Japan, O Sesshin at the Daitoku-ji Sodo, Miss Yoshida "Penny", Washino San, Moritatsu Hosokawa, Hakuin Ekaku, Kashikojima, Mount Hiei and Ryosen-an. Sokei-an Says: The Triune Body of Buddha -- the Trikaya: Sambhogakaya "Bliss Body", Dharmakaya "Law Body" and Nirmanakaya "Body of Transformation". Also, the story of the young monk preaching to an empty room, and then ten years later preaching to a room filled with people. O Sesshin at Crowfields, Vanessa Coward's Mt. Kisco home. This was the First Zen Institute's first full seven-day sesshin, and there was no Roshi involved. 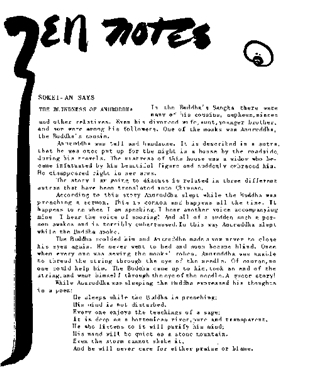 The daily schedule included 6 hours of zazen. 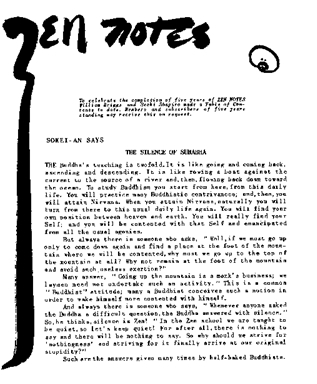 Sketches by Bill Briggs, text by Mary Farkas.